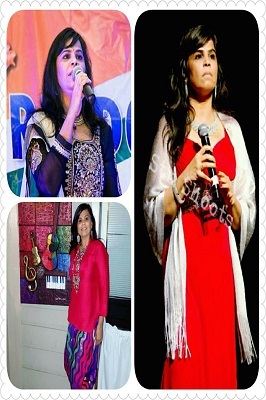 Geeta Khanna works as an IT professional and singing is her passion. From childhood, She participated in cultural activities at school and college level. She was awarded as best singer at Kurukshetra University youth festival. She has learned classical music and currently is a student of shankar mahadevan academy and sing like a star music school. Her other hobbies are dancing. Cooking and traveling. She is a part of dance group “Dazzling Divas”. In 2013, She participated in America got Talent contest and qualified till second round. Tricia grey is her teacher from sing like a star musical school and she gets opportunity to perform in annual recitals every year and in other cultural programs. She achieved the best singer award by people’s choice in Valentine event organized by IACA. Geeta is an active member of Desi Rhythm Of Atlanta band and her interests are in singing classical, Sufi , bhajans , Ghazals and old and new melodious and fast Bollywood songs. Currently she is working on her own album. She believes that music gives a soul to the universe , wings to the mind , flight to the imagination and life to everything.